El Link Sar West (6938m, valle del Charakusa, Pakistan) era una obsesión para el alpinista y fotógrafo británico Jonathan Griffith. En 2015, y tras tres intentos fallidos en años anteriores, logró hacer cumbre por la cara oeste junto con su compatriota Andy Houseman. Los dos presentan las duras circunstancias que sufrieron para hacer cumbre mediante unas imágenes increíbles. Link Sar West (6938m, Charakusa bailara, Pakistan) obsesio bihurtu zen Jonathan Griffith argazkilari britainiarrarentzat. 2015ean, eta aurreko urteetan hiru eginahal hutsalen ostean, lortu zuen gailurrera iristea mendebaldeko isuritik Andy Houseman herkidea soka-kide zuela. Griffithek eta Housemanek igoera haren istorio gogorra muturreko baldintzetan grabatutako irudi ikusgarrietan islatu zuten. Link Sar West (6938m, Charakusa valley, Pakistan) was an obsession for UK alpinist and photographer Jonathan Griffith. 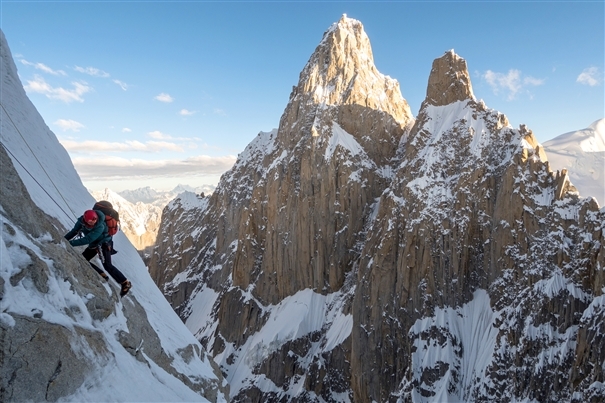 He made three attempts on the peak before reaching the west summit in 2015 on his fourth try with British alpine phenom Andy Houseman. Capturing near disastrous circumstances with riveting video and breathtaking cinematography, Griffith and Houseman present their summit story. Aqui tienes el trailer de la película.